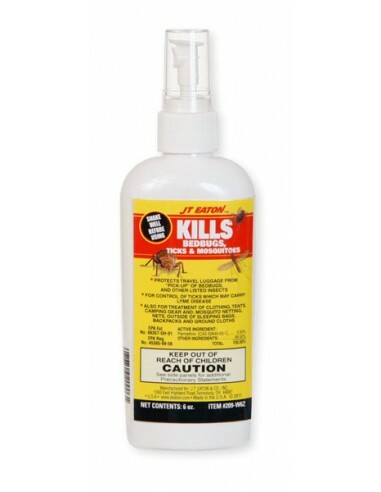 The FIRST insecticide manufactured specifically to be applied to luggage (and mattresses) to prevent the "pick-up" of bedbugs and other listed insects such as fleas, ticks and roaches. Spray outer and inner surfaces of luggage before leaving home or, if already traveling, before returning home ! * Keeps Killing For 4 to 6 Weeks! * Apply to luggage before leaving home to help prevent hitchhiker insects, Bedbugs, Roaches, Fleas, Ticks and insects listed on the label, from being brought home. * Spray outside and inside of luggage before traveling. * Available in 6 oz. Pump Spray Bottle. Apply to luggage before leaving home to help prevent hitchhiker insects, Bedbugs, Roaches, Fleas, Ticks and insects listed on the label, from being brought home. Spray outside and inside of luggage before traveling. Bedbugs, fleas, ticks, roaches, waterbugs, palmetto bugs, scorpions, ants, silverfish, spiders, crickets, carpet beetles, clothes moths, lice, louse eggs, house flies, fruit flies, gnats, mosquitoes, skipper flies, wasps, hornets, bees, black flies, angoumois grain moths, mediterranean flour moths, indian meal moths, and tobacco moths.